It says everything you need to know about the nature of this market that yesterday's 11-point swoon in the SPX felt like a proper downdraft. If you've felt that this month has been unusually quiet, you're not alone- and with good reason. Macro Man ran a few numbers, and was startled to see that as of Tuesday's close (i.e., prior to yesterday's "collapse") there have been only five prior days in his lifetime where the 30 day historical volatility of the SPX has been lower. 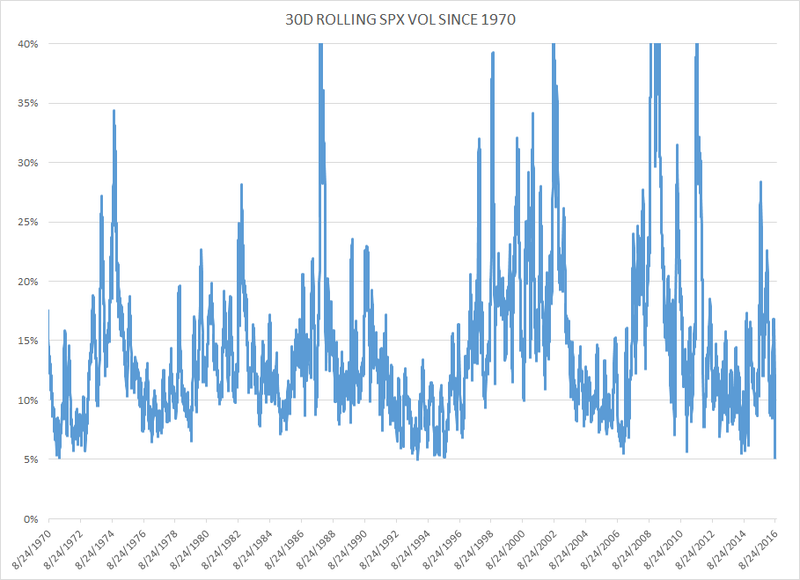 Yesterday's "crash" nudged the historical vol higher, but not by much; the current 30 day historical vol of 5.4% is the 23rd lowest of all trading days since the start of 1970. The days when "market volatility" served as the excuse du jour for Fed inaction suddenly seem like a long, long time ago. US markets are hardly alone in experiencing a decline in volatility, of course; realized vol throughout global equity markets has tumbled this month. That being said, vol in the US is unusually low by global standards (as well as its own.) Amusingly, the other market that has experienced exceptionally low volatility recently has been the UK, another excuse du jour for standing pat. 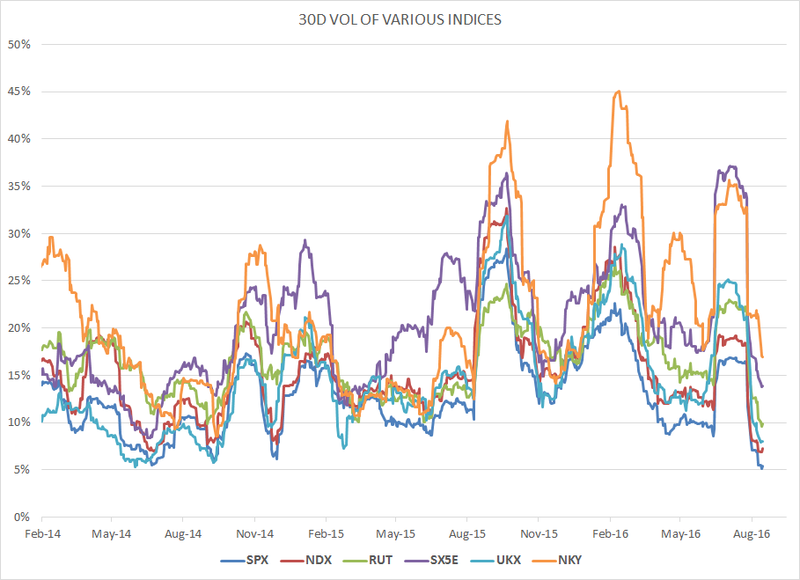 Tellingly, the current trough in SX5E vol is only a little lower than the post-Brexit peak in SPX realized vol. In times gone by, of course, exceptionally low financial market volatility was a source of concern for policymakers. Such conditions, they knew, were unlikely to last but might encourage behaviour that could threaten financial stability when the volatility regime and market risk premia normalized. And for what? Global central banks continue to chase the elusive bogey of arbitrary inflation targets while offering little empirical evidence that such targets can be met. The whole idea of the Fed's potentially raising the inflation target is frankly a farce. There is a veritable Everest of empirical evidence that the sort of impact that the Fed and others can have is woefully insufficient to meaningfully and permanently move the needle on inflation. 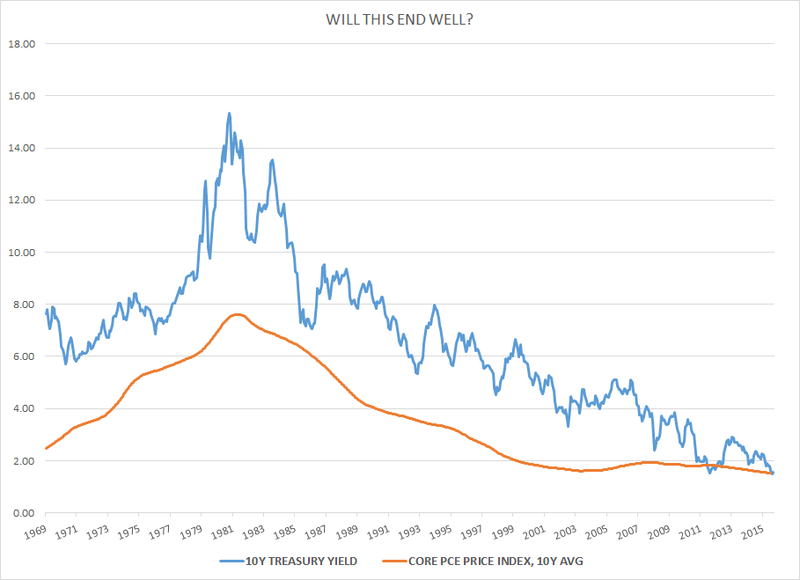 Quite possibly Macro Man's favourite finance-related fun fact, which he trots out every so often, is this: there have been exactly two months in this millennium when the 10y average of the core PCE deflator has been two percent or above. Those two months were January and February of 2000. The Fed has spent most of the ensuing period in ultra-easy mode; see if you can spot on the chart below where they are having an impact and where they are not. Like Tantalus, the Fed (and BOJ, etc.) seem doomed to forever strive to reach the forbidden fruit of an arbitrary inflation target while falling just short. In the meantime, the negative externalities of these attempts via artificially compressing risk premia and volatility while influencing certain actors to engage in irrationally stupid behaviours may yet condemn many in the modern central banking community to a new level of the Inferno. Say what? Selling puts when vix is 11? I guess it qualifies as "reaching for yield"
If funny how they picked up to sell most the beaten asset from all: the volatility. date to be set in October/November - Renzi is going all in and if he loses, the party coming after him wants Italy out of the Euro. EU as we know it would not survive from this so beware. Prime ministers come and go in Italy – four since the financial crisis – but precious little seems to change. The latest incumbent, Matteo Renzi, has pursued structural reform more energetically than his predecessors. But for all the progress he has made, he might as well have been wading through molasses. Now, in a bid to secure a popular mandate for his restructuring program, Renzi has bet his premiership on a referendum over badly-needed constitutional reforms. It is a high stakes gamble. If Renzi wins the vote, which is due in either October or November, his proposed measures will streamline Italy’s legislative process, breaking the parliamentary gridlock which has crippled successive governments, and opening the way to far-reaching economic reforms. If he loses, Renzi has promised to step down – a pledge that has turned the referendum into a popular vote of confidence in the unelected prime minister, his Europhile policies, and by extension Italy’s membership of the eurozone itself. As a result, a “No” vote in October will not just precipitate the fall of Renzi’s government; it could throw Italy’s long term membership of the eurozone into doubt, plunging the single currency area once again into crisis. might that intro be out of date? "This weekend, PM Renzi took new steps to draw a neat line between the content of the reform subject to the referendum and an evaluation of his leadership. He explicitly said that elections would not happen before the natural end of the term (2018) no matter what is the outcome of the referendum. In our view, this was mainly a further attempt to reduce the degree of conflict in the electorate, under the basic premise that within the electors who do not support Renzi there is a fair share of those who would still agree with the constitutional reform. But we also think that Renzi’s statements reduce, at the margin, the risks connected to a negative referendum outcome. While it is still well possible that Renzi will resign under that scenario, it is now more likely that he would be willing to remain at the head of the government provided that the President of the Republic were to refuse his resignation and his current majority were still in place. This reinforces our belief that a sharp discontinuity in Italian politics could be avoided even in the most adverse scenario, and it further suggests that it would not be strictly necessary to rely on a caretaker government supported by a new majority (which in itself would require time and heighten uncertainty). Of course, a continued Renzi premiership under these conditions would be challenging, but at least there would still be time for the system to stabilise rather than entering a stage of renewed instability." So according to JP Renzi if he loses his referendum won't be obliged to fall on his sword ? Then I guess they thought the same about Cameron? Perhaps we would all profit from not listening to opinion loosely wrapped up has fact because the point of origin is supposed to be respected for it's analytical insight. As we know, opinion , everybodys got one. @checkmate: aren't you fighting windmills here? My bad for bringing JP into the mix - they just picked up on public news and I happened to read it first in their email. One has to differentiate between Renzi as PM and new parliamentary elections. ....It certainly appears we need more NIRP! Speaking of vol, another instrument that hasn't moved much lately is the yen. We are watching USDJPY very carefully as it teeters on the top of a shelf at 100, where it has been becalmed for some time. Although some believe that this is a level that is defended by the BoJ, there are no obvious data to support this. While we are generally dollar positive, we don't want to take a position in USDJPY until there is some movement, as there is a significant chance that ¥ can strengthen to 95. One of the most bearish developments here would be a sizable rally in ¥, and that might indeed be one of the most significant consequences of a lack of backbone by the Fed in the days and weeks ahead. Given that a great deal of the yield seeking that has gone on this year has been by Japanese investors looking for yield in US assets, even a modestly stronger yen can lead to substantial volatility. This was the case in the market downdrafts last August and in the winter. As MM points out above, very quiet markets have historically led to people doing silly things with leverage in order to generate alpha. One never knows quite how much leverage is employed until after the fact, when there are conversations like this: "you were doing what? with HOW MUCH leverage?". Mr Corzine and others will be familiar with this scenario. Durable goods orders strong, initial claims low. What more could Janet & co possibly want to see? Esther George is pointing out once again that this might be, you know, a good time to get one in….. but of course Esther made her mind up a long time ago. We suspect that Lael Brainard might be an important voice in Dame Janet's ear, perhaps joining Fischer and Dudley in Yellen's informal kitchen Cabinet (to revive a very old phrase from British politics). Come on, Janet, for Heaven's sake, show those claws, and remember that the US banks you serve would welcome both a steeper curve (hawkish Fed and stronger macro) - as well as a step away from the madness that is NIRP, which threatens to engulf their European brethren. @left - allow me to be the voice for the silent majority - on 'what more could janet &co possibly want to see?' the answer is bloody nothing - this is their worst possible scenario, where they are running out of excuses - but the weight of historical evidence overwhelmingly favors a scenario where Yellen whips out a thesaurus to look for words similar to 'patient', 'gradual', and 'eventually'. As for the steeper curve, that's tantamount to saying the bond bull market is over - I refer you to the wasabi laced discussion on the subject on this very board yesterday. Although I would like to see Fed raising rates, two reasons are powerful enough for Janet to not considering it now: 1) She wants to help Hilary become the next president, given that Dem helped her become the chairwoman and Trump wants to fire her; 2) other major countries were in full easing modes. Everything is possible of course. But I believe that these two factors outweighed economic data at least for this year. hawkish speechs in the weeks before FOMC and probably J. hole but no hike in september. Kevin Warsh's article in the WSJ should be compulsory reading for everyone - truer words were never spoken. This one blew me away, even though I was in the market the entire time: "From early 2008, more than half of the gains in the SP500 occurred on the days of FOMC decisions." Of course, he was there when bernanke was pouring gasoline, so he gets the blame for some of the fire and its easy to criticize the guys who are still in the FOMC now that he is outside - still, one wishes for an alternate universe where Janet Yellen would read the article and agree with it. Fk it, it's last orders at the hotel bar in Manila and I wanna long some vol for the pa. Can only do so via etf opts. Should I buy calls on vxx, puts on iwm, puts on ewz? With It referendum (and US elects) in mind, thinking of Dec exp. Any suggestions would be much appreciated. Aside from that, many thanks to MM, Nico, LB, washed, checkmate, and all the many thoughtful members of the board. If Brexit couldn't get vol to do anything more than flip the pillow and promptly fall back asleep, why should we expect Italexit to get it to the breakfast table? As for the supposedly data dependent Fed, there is no longer any telling what might get them to move. That being said, I did sell some EURUSD this week just in case of a surprise. They are all wanna be hawks who talk the talk but can't walk the walk for whatever reason cowardness, politics..."
Dec vol might not be inexpensive, and it depends on whether the vix curve flattens or the whole thing takes off vertically. If she says "one hike only, September is live", then Dec vol might not be the best way to go. Not much is cheaper than Sept vol. IWM Oct puts? or Sep puts if you have massive balls.... as always position size is the best way to control your risk... vxx calls? Hmm.. only if u r feeling very lucky and are betting on a cheeky squeeze of lazy vol sellers. Bonne chance, monsieur. "This one blew me away, even though I was in the market the entire time: 'From early 2008, more than half of the gains in the SP500 occurred on the days of FOMC decisions.'" Have known that "forever" (actually, it was all of the net market gains have occurred on FOMC decision days and the period +/- one day surrounding it). All net market gains have occurred on the first trading day of the month (and the period +/- three days surrounding it). All net market gains have occurred when Congress is not in session. We've been staying away from VIX since we closed our XIV position back in mid July. At that time I mentioned that despite a historic low (complacent?) VIX level, going long VOL was just too expensive, especially at the short end of the curve. VXX is down -20% since that time. I'll be the first to point out that we clearly missed an additional +20% move had we continued to hold XIV, but the risk/reward didn't look worth it at the time for either VXX or XIV, thus we stayed flat. Today, I'll make a similar point. Even with recent VIX moves back into the 13's, contango is still too rich for our taste. That being said, we are getting close. I'll be waiting for a VIX move into the mid-14/low-15 range then a retracement back to mid-12's before being tempted to go long. Switching asset classes (seems strange VOL can even be considered one...but these are the times we trade in), I'm struggling with REITs here. Especially within the "reach for yield" narrative. We use VNQ as a liquid REIT proxy and I've been watching the yield closely for signs of crowding. With a T12 yield of ~4% currently, this doesn't look particularly low, at least relative to levels over the last 5-6 years (T12 yields have touch below 3.5% a number of time in that time frame which would require another +10% price move from here). If we look at spreads to the 10y we are close to the highest level since 2011. Now I'd venture that this spread says more about the price of treasuries than REITs, but even if you "Normalize" the 10yr (we model a normalized 10yr to 2.7%...I'll note this has done little to help out short treasuries position...so far), and look at that relationship over the same time frame, the spread to VNQ T12 is basically at median. I hate to continue to hold REITs after the recent run, but its hard to justify a sell based on yield crowding when I don't yet see it in the data. Any thoughts would be appreciated. Leftback, I think you are looking at the wrong antipode to short (my biggest position is long AUD/NZD). I can't emphasize enough how significant the Fonterra payouts are for the New Zealand economy (by my calculations, they equaled six percent of GDP in 2014). @anon 8:01 - those are some fun (and telling) facts - thx very much for sharing. @Maelstrom I said this yesterday and will repeat it - there is so much roll pressure now (to clarify to LB, the rolling from length far outweighs the the anti-roll from short instruments) that a deep contango in the VIX curve can be safely assumed to be a quasi-permanent state of affairs - I am not sure how much to adjust for that. "She wants to help Hillary become the next president, given that Dem helped her become the chairwoman and Trump wants to fire her"
PS: i've been reduced to buy 2169 to offer again at 2175. I have no dignity left. What is the difference between a Sep raise and a Dec raise on Fed fund rate? Probably nearly zero on real economy. But it could make a ton of difference on capital markets and politics. After the election, there is a much greater chance that FOMC will hike if there is no sudden recession between now and then. Hilary might welcome one even it cause a stock market crash: she will not be blamed for the crash and can take credits for recovery. An assassination attempt on Merkel has just been foiled in Prague. In France Sarkozy launches presidential campaign focusing on "France for French" and blasting muslims and minorities. A leaked memo today exposes Soros plan to destabilize Russia. Largest European pension fund warns central bank pumping of markets is biggest concern. So, all quiet as we head into the weekend... (links below). i've seen the 30 day realized vol stat a couple times now, why the fixation on 30 days? 30 business days come out to smth like 1.5 months. it's not 1 month which would be 21 business days. i think if you pick some arbitrary lookback window during low vol periods you can always find one which is the lowest in X number of years.